National Daiquiri Day: a brief history of the cocktail, with appearances by Ernest Hemingway and F. Scott Fitzgerald. The daiquiri requires a temperate approach. Photograph by Aaron Gustafson via Wikimedia Commons. While steeling yourself for the intercom din of National Drive-Thru Day (a July 24th event recognized by the U.S. Chamber of Commerce) and for the frying-grease torrents of National Junk Food Day (July 21st, and perfectly superfluous in a land that recognizes National Drive-Thru Day), contemplate that today, the 19th, is National Daiquiri Day. Think this over at cocktail hour, over a daiquiri, sure, but just one. This trickiest of classics—a compound of light rum, lime juice, and sugar—requires a temperate approach. 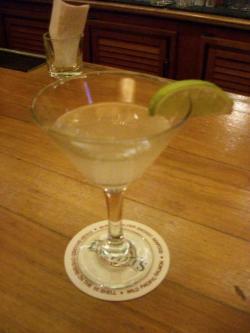 It is observed that some anonymous sailor or campesino must have devised this simple drink beyond the reach of historians, but the introduction of the daiquiri to these shores is—like the ascendancy of William Randolph Hearst and the invention of the rum-and-Coke—a consequence of the Spanish-American War. In June of 1898, the Rough Riders invaded the Cuban town of Daiquirí; a few years later, a mining engineer brought the concoction to the notice of the English-slurring world, and an admiral delivered the recipe unto The Army and Navy Club in Washington, D.C. Reliant on Caribbean distilled rum, the daiquiri fared well through World War II, when domestic distilleries were converted to military use, but it began a certain fall from grace sometime thereafter. Once middle America began to serve this potion as a frappé or to flash-blend it, there began the creep of the low-down frozen daiquiri, not just juvenile but infantile, sludging across whole communities like the Blob, but with sucrose. At issue is the delicate matter of balance. Here, when we use the term, we are talking about not only pleasing the tongue’s taste receptors but also maintaining the inner ear’s vestibular system. The double asks for trouble. Consult Hemingway’s great frenemy, F. Scott Fitzergald, who was, with This Side of Paradise, the first novelist to record the drink. * About a third of the way into the book, protagonist Amory Blaine makes some gains in losing his innocence at a New York nightspot, its clientele “mostly from the colleges, with a scattering of the male refuse of Broadway, and women of two types, the higher of which was the chorus girl.” Encouraged by a chorus-girl companion with the suspiciously delicious name of Axia Marlowe, Amory orders a double daiquiri and has a bad trip. He entertains an “inexpressibly terrible” vision of a man with a face like yellow wax. It is the devil, and it is America’s first intimation of the curse of the double-dose of daiquiri. The prospect of it glows like a red danger sign or, for that matter, a 96-ounce bucket of industrial strawberry-daiquiri mix. Please bear this in mind when ordering daiquiri to go on National Drive-Thru Day.